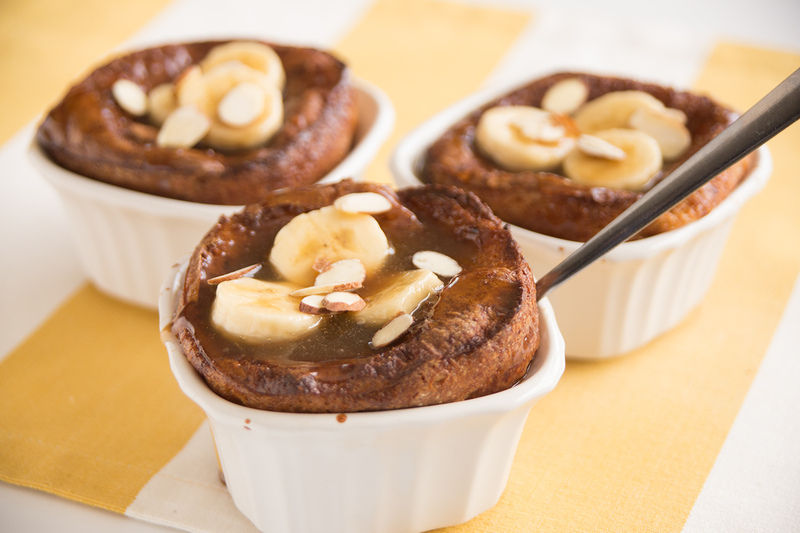 The sauce with this bread pudding makes it just that much better! Slice each roll in 3 crosswise slices. Spray generously 6 (7 ounce) ramekins. Place the bottom slices of the rolls in the bottom of each ramekin. Whisk together eggs, sugar, milk, vanilla, cinnamon and nutmeg. Pour about 1/4 cup milk mixture onto the top of each roll slice in the ramekins. Place the top slice of each roll, upside down on top of the milk mixture. Pour in more milk mixture. Place the middle slice of each roll on top and pour in more milk mixture. Try to get the same amount of milk mixture in each ramekin while making sure the rolls are absorbing the liquid. Place the filled ramekins on a baking sheet and bake at 350F 45-60 minutes. They will puff up and start to brown. A knife inserted into the pudding will be moist but not runny. Remove from oven and let cool 15 minutes. They will sink. Spoon rum sauce over the top of each one. Top with bananas and sprinkle with almonds. Melt butter over medium heat and add brown sugar. Bring to boil and let boil while stirring for 30 seconds. Remove from heat for a few minutes. Stir while slowly adding cream. Return to heat and bring back to a boil then remove from heat. Carefully add rum extract. The sauce will thicken slightly as it cools.